Simulation is one of the required courses for the MBA degree with MIS concentration at Arkansas State University. The course was developed a few years ago with the help of a colleague (Dr. John Seydel). We use Simulation Using Promodel, Third Ed. (Harrell, et al., Ghosh and Bowden, McGraw-Hill) for the course. In addition, students have access to the full-version of the Promodel software in our Data Automation Laboratory. The course has attracted graduate students from other areas including arts and sciences, social sciences and engineering technology who took the course as elective or for enhancing research capability. Students experience the entire cycle of simulation modeling and analysis through comprehensive group projects with a focus on business decision making. Most elements of waiting lines are shared by various queuing systems regardless of entity types such as human, inanimate, or intangible. However, a few features are unique to human entities and service systems, two of which are balking and reneging. One of the fairly recent class projects included modeling the university’s main cafeteria with various food islands. Teams were directed to also model balking and reneging, which was challenging. The project led to studying various balking and reneging scenarios and their modeling implications, which was very informative. Disregarding the simple case of balking caused by queue capacity, balking and reneging happens because of impatience. Balking means customers evaluate the waiting line, anticipate the required waiting time upon arrival (most likely by observing the queue length) and decide whether to join the queue or leave. In short, balking happens when the person’s tolerance for waiting is less than the anticipated waiting time at arrival. Reneging happens after a person joins the queue but later leaves because he/she feels waiting no longer is tolerable or has utility. Literature indicates that both decisions can be the result of complex behavioral traits, criticality of the service and service environment (servicescape). Therefore, acquiring information about and modeling balking or reneging can be hard. However, it offers additional information on service effectiveness that is hard to derive from analyzing waiting times and queue length. On arrival, the entity joins the queue only if the queue length is less than a specified number but balks otherwise. On arrival, the entity joins the queue if the queue length is less than or equal to a specified number. However, if the length of the queue exceeds, the entity joins the queue with probability and balks with probability (Bernoulli distribution). The same as Model 2 but several (Bernoulli) conditional probability distribution is constructed for various queue lengths (see the Example). On arrival, a maximum tolerable length of queue is determined from a discrete probability distribution for each entity. The maximum number is then compared with the queue length at the moment of arrival to determine whether or not the entity balks. The first three approaches model the underlying tolerance for waiting implicitly. 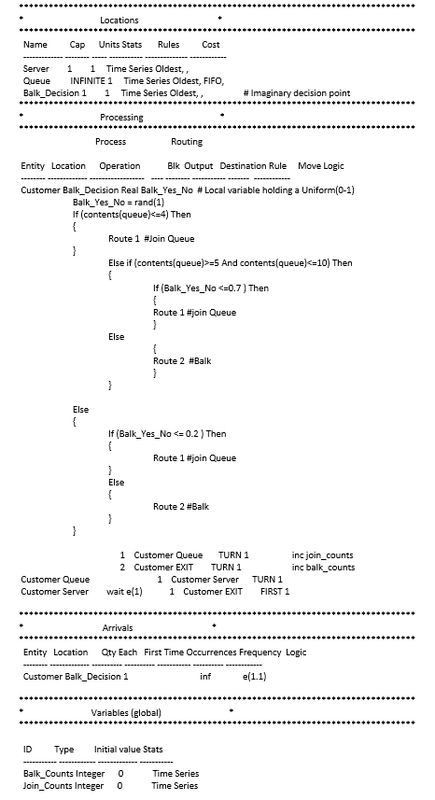 Model 4 allows tolerance variation among customers to be modeled explicitly. A simulation example of Model 3 is presented. The purpose is to demonstrate the structure of the model and not model efficiency and compactness. The model includes a single server, FCFS discipline, random arrival and service. The conditional probability distributions of balking behavior are presented in the table. The data must be extracted from the field. The simulation model is also presented below. After running the models for 10 hours, 55 (10% of) customers balked. Balking information can be very useful in designing or fine-tuning queuing systems in addition to other statistics such as average/maximum waiting time or queue length, etc. Dr. Farhad Moeeni is professor of Computer and Information Technology and the Founder of the Laboratory for the Study of Automatic Identification at Arkansas State University. He holds a M.S. degree in industrial engineering and a Ph.D. in operations management and information systems, both from the University of Arizona. His articles have been published in various scholarly outlets including Decision Sciences Journal, International journal of Production Economics, International Journal of Production Research, International Transactions in Operational Research, Decision Line, and several others. He has also co-authored two book chapters on the subject of automatic identification with applications in cyber logistics and e-supply chain management along with several study books in support of various textbooks. . He is a frequent guest lecturer on the subject of information systems at the “Centre Franco Americain”, University of Caen, France. Current research interests are primarily in the design, analysis and implementation of automatic identification for data quality and efficiency, RFID-based real-time location sensing with warehousing applications, and supply chain management. Methodological interests include design of experiments, simulation modeling and analysis, and other operations research techniques. He is one of the pioneers in instructional design and the teaching of automatic identification concepts within MIS programs and also is RFID+ certified. 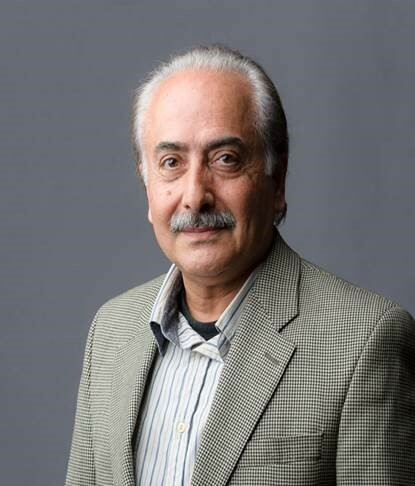 Dr. Moeeni is currently the principle investigator of a multi-university research project funded by Arkansas Science and Technology Authority, Co-founder of Consortium for Identity Systems Research and Education (CISRE), and on the Editorial Board of the International Journal of RF Technologies: Research and Applications. This entry was posted in General Simulation and tagged Arkansas State University, balking, Consulting, custom software, decision support, discrete event simulation, Dr. Farhad Moeeni, Modeling, Predictive Analytics, prescriptive analytics, Process Engineering, Process Management, process modeling, promodel, simulation toolset. Bookmark the permalink.